Interview with confidence and create an effective job search strategy! Beginning your job search with the right mindset and strategy is crucial. Bridgemore Resume Design's Career & Interview Coaching session will prepare you and help you gain confidence during this process. Coaching sessions are very relaxed, as we want you to feel comfortable to ask any questions you have and gain as much as possible from the time we work together. Each session lasts one hour and is tailored to meet your needs. Our coaching is typically divided into three parts. However, we will gladly tailor the hour to your specific needs. Maybe you've been stumped by a question on a job interview before or don't feel confident about specific aspects of interviewing. Perhaps there's an aspect of Interview Coaching and Job Search Strategy (see below) that you would like to focus on. We will address your questions and concerns and give you the knowledge you need to feel confident in your next interview! 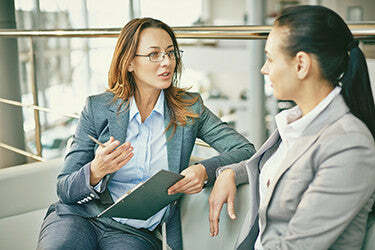 Here we will cover the actual interview process: what to expect from the interviewer, behavioral-based interviewing techniques, how to answer difficult or uncomfortable questions, and the interview exit procedure. We will also discuss post-interview etiquette including the use of a post-interview thank you letter and follow-up procedures. "The whole process has been very professional and organized. Victoria is very knowledgeable about professional resume writing and preparing her clients for a job search. In addition, she went above and beyond what was expected to help me prepare. It has been many years since I had a resume and cover letter made, my LinkedIn profile updated. and I received an hour of interview coaching." "Well Victoria, I just was offered the perfect job! It is with Universal Property and Casualty, the same company I emailed you about last week. It was an interview that went so well, and I really feel good about this. I really don't think I could have gotten my foot in the door with out your beautifully designed resume and cover letter. Thank you again for your professionalism, advice and patience. I will gladly recommend your service to anyone."